Now open your FTP client program on your work station (something like FileZilla, WS_FTP, SmartFTP or gFTP) and try to connect. As hostname you use server1.example.com (or the IP address of the system), the username is exampleuser, and the password is secret. If you are able to connect - congratulations! If not, something went wrong. 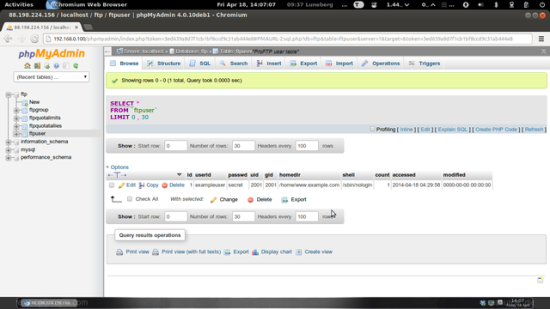 For most people it is easier if they have a graphical front-end to MySQL; therefore you can also use phpMyAdmin (in this example under http://server1.example.com/phpmyadmin/) to administrate the ftp database. userid: The name of the virtual Proftpd user (e.g. exampleuser). passwd: The unencrypted (i.e., clear-text) password of the user. uid: The userid of the ftp user you created at the end of step two (e.g. 2001). gid: The groupid of the ftp group you created at the end of step two (e.g. 2001). homedir: The home directory of the virtual Proftpd user (e.g. /home/www.example.com). If it does not exist, it will be created when the new user logs in the first time via FTP. The virtual user will be jailed into this home directory, i.e., he cannot access other directories outside his home directory. shell: It is ok if you fill in /sbin/nologin here by default. name: The name of the virtual Proftpd user (e.g. exampleuser). quota_type: user or group. Normally, we use user here. per_session: true or false. true means the quota limits are valid only for a session. For example, if the user has a quota of 15 MB, and he has uploaded 15 MB during the current session, then he cannot upload anything more. But if he logs out and in again, he again has 15 MB available. false means, that the user has 15 MB, no matter if he logs out and in again. limit_type: hard or soft. A hard quota limit is a never-to-exceed limit, while a soft quota can be temporarily exceeded. Normally you use hard here. bytes_in_avail: Upload limit in bytes (e.g. 15728640 for 15 MB). 0 means unlimited. bytes_out_avail: Download limit in bytes. 0 means unlimited. bytes_xfer_avail: Transfer limit in bytes. The sum of uploads and downloads a user is allowed to do. 0 means unlimited. files_in_avail: Upload limit in files. 0 means unlimited. files_out_avail: Download limit in files. 0 means unlimited. files_xfer_avail: Tranfer limit in files. 0 means unlimited. The ftpquotatallies table is used by Proftpd internally to manage quotas so you do not have to make entries there! Now anonymous users can login, and they can download files from /home/anonymous_ftp, but uploads are limited to /home/anonymous_ftp/incoming (and once a file is uploaded into /home/anonymous_ftp/incoming, it cannot be read nor downloaded from there; the server admin has to move it into /home/anonymous_ftp first to make it available to others).